Floyd Mayweather has branded Manny Pacquiao 'a coward' and ruled out a rematch with his great rival. 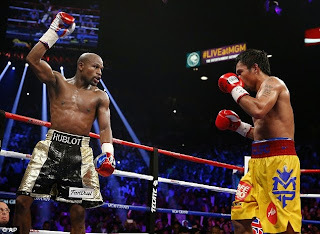 Mayweather was a convincing winner of their $300million 'Fight of the Century' in Las Vegas last weekend. Pacquiao later revealed he had suffered a shoulder injury in training and underwent successful surgery on Wednesday. But Mayweather claims he has lost respect for the Filipino after his admission. In an interview to be broadcast by Showtime on Saturday, he says: 'Excuses, excuses, excuses. 'He was fast. His left hand was fast. His right hand was fast and he was throwing them both fast and strong. After the fight, Mayweather texted an ESPN presenter that he would be prepared to offer Pacquiao a rematch when he recovers from his injury. But he has now ruled that out as he eyes a September swansong in what will be his 49th fight. 'Did I text Stephen A Smith and say I will fight him again? Yeah, but I change my mind,' he added.